Brighten your loved one's day with this beautiful and colorful Tropical Embrace Bouquet, featuring fuchsia carnations, lavender chrysanthemums, orange Asiatic Lilies, and red Peruvian lilies! 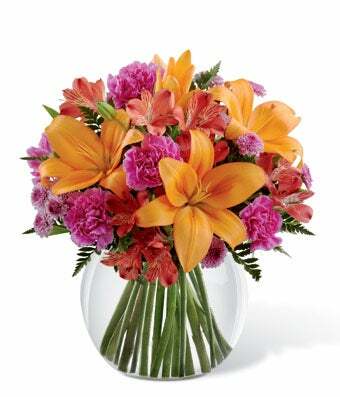 Accented with lush greens, this floral bouquet offers a wonderful presentation of striking tropical colors. The arrangement arrives hand-arranged in a glass bubble bowl vase and is sure to convey your warmest and most heartfelt wishes to your special recipient.